Bikini Line, French, Brazilian and Sphinx - if those names don't bring a small shudder, then you've never had the experience. They are just a few of the terms used to describe different types of waxing for a woman's privates - everything from just the edges to naked as a new born front to back (yes - even the derriere). Men and women alike have seemed to develop a fascination with being hairless in the last decade that sends them in droves to undergo this procedure, despite the discomfort. I find it fascinating. This whole article came about when I was trying to wind down late at night - flipping the TV channels in desperation for something soothing and mindless to help me relax. I was suddenly stopped by the sight of 2 women encouraging another into a small salon room and closing the door behind her as they grinned like Cheshire cats. What was awaiting her? Her very first waxing session. I am not sure whether they chose to leave her a small patch or stripped her bare from front to back, but the sounds of RIP-SCREAM came rolling through the door as the 2 ladies laughed and joked. She hobbled out of the room with a smile on her face, so survived. But the yelling that came through the door prior made it clear this had been painful. I quickly moved on to another station. Going through discomfort for the sake of beauty is nothing new. There was foot binding to create the "Perfect Lotus" - a 3 inch foot creating through the practice of Foot Binding, the removal of lower ribs to create a more wasp shaped figure and a friend of mine even met an elderly lady in a museum who had the little toe removed from both feet so that she could fit the narrow pointed shoes fashionable at the turn of the century. So a little pain to remove unwanted hair is actually very small in comparison. It just surprises me that in this day and age, people want to experience that discomfort. I have to admit, other than a few home waxing strips to take care of stray hairs, I have avoided the process like the plague. If I could do it once and it would take care of unwanted hair permanently, I would. Somehow going back every 6-8 weeks just doesn't instill a sense of anticipation. I did learn a few things from my home trials. 1. NEVER start it if you can't finish it. RIP-SCREAM is the only way it's coming off. There is no gentle alternative if you chicken out. You'll be walking around with it stuck to your face for a long time. 2. NEVER apply the wax until you know which direction to pull. There actually is a right way to do this. If you pull the wrong way it won't work right and you'll have to do it all over again (or abandon your efforts). 3. NEVER be faint of heart. Whether you do it yourself or wisely leave it to a professional, it's an all or nothing go-for-it moment. 4. NEVER wax before an event. My very first attempt was a small amount of hair on my lip that I thought I would try taking off at home. My lip reacted by swelling up slightly and turning red. Fortunately it passed quickly, but it was a close call. 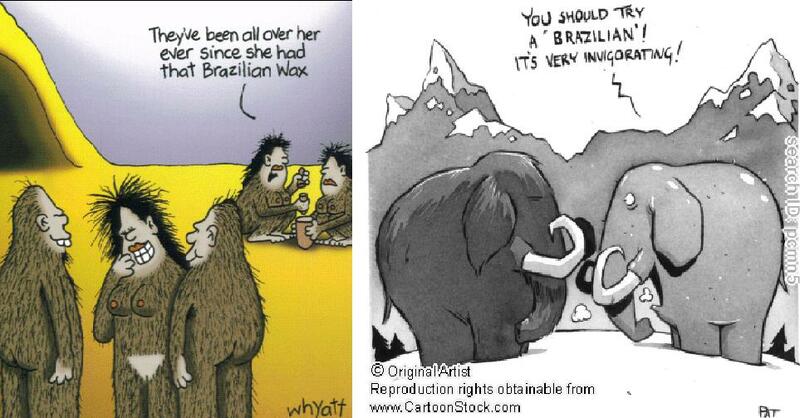 Waxing for women has a wide variety of targets. Legs and bikini waxing probably top the charts, but other areas include eyebrows, chin, upper lip, arms and underarms. Bikini waxing has become so popular that they even have new fun options - Landing Strip, Mohawk, Martini Glass, Bermuda Triangle, Postage Stamp and Heart Attack. Long gone is the aesthetic where men fantasized about the colour of a woman's pubic hair. Now I can only assume they wonder if she has any and if so what shape it is trimmed into. I personally find the naked-as-a-bluejay look a bit creepy - sort of like going back to being a pre-adolescent. However, I really wouldn't want to see massive amounts of hair exploding out of ultra small thong bikinis we see nowadays either. With the advent of the exposed six-pack, men have also embraced the hairless look. In previous times, you weren't manly if you didn't have some chest hair and the need to shave. Teenage boys desperately awaited the growth of those first few strands and proudly flaunted them on arrival. No longer. Pity the man who has a massive amount of chest and back hair. It won't be easy or pleasant. While these areas are probably the first choice for men, they also do arms, legs, underarms, feet, hands and even their own form of the Brazilian that includes the testicles! Now that has to be one serious OUCH! It has often been stated that if men had to bear the children. the human race would die away as they couldn't handle the pain of labour. I would say any man who can handle a full Male Brazilian could probably prove the naysayers wrong. There are other options: going natural or old fashioned shaving at one end to permanent hair removal at the other end (laser if your hair is dark in colour or electrolysis). The in 2015 we saw a new trend of bleaching then dying the underarm hair a neon color. Who knows if this will actually catch on. If you chose to wax, be aware it us not recommended if you have a contagious skin condition, have thin or fragile skin or are using steroid medication or Roaccutane. 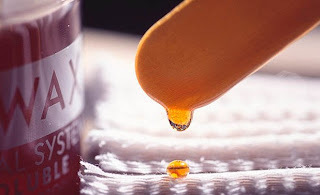 Wax should also not be applied in areas with raised moles, skin tags, abrasions, bites, broken skin, bruises or varicose veins. And most importantly don't forget to make sure the spa you go to has excellent hygiene. So to wax or not to wax? That is the question. Only you know the answer.